Enjoy running, music, food (famous Vietnamese Banh Mi" and "Pho" noodle soup), and fun. A last chance race for 2018. Finish Strong!. Race Day Registration - Subject to availability-Email RD run4foodandfun@yahoo.com . Add $10 to late fee. Registration: ONLINE Registration with Ultra Signup (Click Here). NO TRANSFER. NO REFUNDS. Online Registration closes at midnight Tuesday, December 11, 2018. Note: Runners under 18 years old, must get approval from Race Director and written consent from parents or guardians. Race Director reserves the right to cancel the event due to severe weather, flooding, park closure, or in any other event or situation that could affect the safety of runners, volunteers, and race staff. If the event is cancelled, an attempt will be made to reschedule, but there will be no refunds. T-shirts: Register by October 31, 2018 to guarantee T-shirts size. After October 31, t-shirts size are not guaranteed. Half-Marathon: First lap is an out an back of 1/2 mile out and 1/2 mile back, followed by 6 regular laps. Marathon: 1st loop is an extended loop, followed by 12 regular laps. 50K: First lap is an out an back of 1/2 mile out and 1/2 mile back, followed by 15 regular laps. You may change to a lesser distance PRIOR to the start time (NO REFUNDS). At Start /Finish Area Bear Creek Park between 6:30 AM  7:15 AM on Race Day, Saturday, December 15, 2018. Half-Marathon & Marathon  Parking by the Tennis Court. Ultra  Parking near the start or along the jogging trail with easy access to your car if needed. At each 2.01 Mile Loop (Start/Finish). Menu with over 50 items including: salt, pepper, ketchup, mustards, mayonnaise, relish, pickles, and soy sauce. Drinks: Water, Gatorade, Coke, Coke Zero, Diet Coke, Sprite, Sprite Zero, Ginger ale, Mountain Dew, Cold Tea, Hot Tea, Starbucks Coffee, and Orange Juice. Snacks: Variety of chips, crackers, candies, trail mixes. Pastries: Bagels with cream cheese, muffins, cookies, cakes, pies. Fruits: Bananas, Apples, Oranges, Grapes. Food: Breakfast tacos and Vietnamese "Bahn Mi" . There will be a drop bag location area adjacent to the Aid Station. Ultra distance runners  Easy access to your car along the jogging trail. There are 2 restrooms adjacent to the 2.01 Mile loop. One near the start/finish area and the other one is approximately half way around the trail. Note: There will be NO place awards. This is a small, fun runner's friendly event. Everybody is a winner for toeing the start line. Pre-Race Announcements: 10 minutes before the start at the STARTING LINE. Shoe chips will be available for pickup starting at 6:15 AM on race morning near the start line. We will be providing two shoe chips to ensure the accuracy of the lap counts. Results: Results will be available on the following web sites: HRF, Ultra Signup, Run Houston Timing website, and will be submitted to Ultra Running Magazine. Camping tents are allowed ONLY on the grassy area along the trail. ABSOLUTELY NO SPIKES (Park Rules). 1. Course will be open to the public during park hours, from 7:00 AM  10:00 PM. You should expect to see walkers, joggers, baby-strollers, etc. Please share the trail with them. Please do NOT run/walk more than 2 abreast. Yield to faster runners passing. 2. Parking Lot Crossings  The race does not cross any streets; however, there are few intersections at various parking lots. Signs will be posted to make park users aware that a Race is In Progress. Please use caution while crossing parking lot entries. 3. The main gate entrance is located at the intersection of N Eldridge Parkway and War Memorial Drive. Park hours are from 7:00 AM  10:00 PM. If you need enter or exit the park outside these hours, the main entrance gate will be open on the hour by Park Security. Please plan accordingly. 4. Glass beverage containers are prohibited. Absolutely no littering. Volunteers  Needed for various shifts and are greatly appreciated. Volunteers will receive Volunteer Amenities. Please email to: run4foodandfun@yahoo.com with your desired shift and shirt size. Crews, Family and Friends  Bring chairs and popup tents to sit and cheer for the runners. There is a small zoo across the park for your little ones. The Houston Running Festival supports the Operation Smile, http://www.operationsmile.org. Operation Smile is an international children's medical charity which provides free life-changing surgeries for children with cleft lip, cleft palate and other facial deformities. 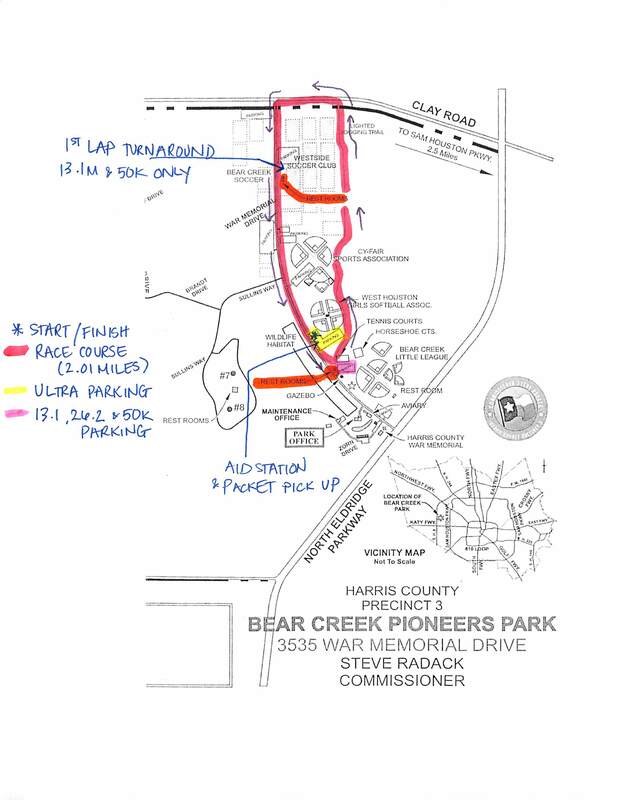 Holiday Inn Express & Suites Houston I-10 West Energy Corridor  Distance to Bear Creek Park (Start/Finish): 4.4 miles.